South Korea fails, while an American startup cruises along. 9 is a truly impressive piece of technology. exact moment the “vehicle exploded in flight”? This was the second attempt at firing a rocket made in Korea into space with a mission to deliver a satellite into orbit: The first Naro-1 launch in August failed at the last minute when its aerodynamic nose cone failed to separate in space, trapping the satellite inside. A technological tragedy, for sure. 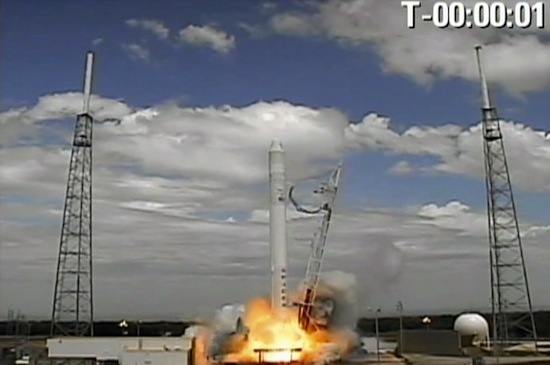 But Naro-1’s failure highlights the astonishing success of the recent Falcon 9 launch by U.S. company SpaceX. This two-stage rocket, which at 333,000 kilos is more than twice as heavy as the Naro-1, is an entirely privately designed and built endeavor. It successfully launched last Friday, popping a dummy “test” payload into almost exactly the predicted orbit window. SpaceX is now extremely confident about the next couple of Falcon 9 flights. The next one is due “late summer,” and will be the first full demo of an ISS resupply mission, operating under the Commercial Orbital Transportation Services program. For that flight, a dummy Dragon space module will fly right by the ISS and then back into the atmosphere. During a second test flight, the Dragon module will finally be captured by the ISS arm and mated to the station.